Dissecting the layers of his cultural identity through building rich layers of paint and fabric on his canvas, Khaled Hafez strongly contributes to Egypt’s dynamic art scene. “Everything I do, I do for my art,” Hafez confesses. The artist lives for his art, and uses it to record moments of glory and frustration. This July, Hafez exhibits his artwork at London’s first-ever contemporary Arab arts and culture festival, Shubbak, representing Egypt’s cultural personality for the world to study and dissect. Khaled Hafez has delved deep into the arts, exploring painting, installation, photography and video art. Recently, the artist has been crafting collages that bridge cultural and temporal gaps through combining Ancient Egyptian symbols with modern magazine snapshots. Through creative colour infusions, intricate detail, and original use of materials, Hafez’s canvases tell stories of a rich and layered cultural identity. Despite his parents’ insistence to send him to medical school, Hafez did not abandon the dream that had emerged at the tender age of fifteen. He wanted to be an artist, and nothing, not even scalpels and lab coats, could stop him. He started taking afternoon classes at the Faculty of Fine Arts, and it was not until a decade later that his parents discovered his blooming career. At the onset of his career, two of Egypt’s most established painters played a pivotal role in shaping his approach towards art. “Zakaria El Zeiny was a great teacher, and Hamed Nada was a great painter,” Hafez reminisces. Other artists have immensely affected the Egyptian’s career. “Pablo Picasso is the ultimate model for a disciplined artist who sacrificed pleasure to have a long and sustainable career.” American artists Robert Rauschenbergand Jean-Michel Basquiat, taught Khaled Hafez that painting may be a job, but it is also a source of pleasure and a cause for passion. “Do what you love, and you will never work a day in your life,” the artist says with a spark in his eyes. Gustav Klimt (well-known for his legendary “Kiss” painting), an expressionist who injected ornamentation and gold embroidery into his paintings, taught Hafez the unique blend of aestheticism and expression. “Art should be beautiful, but it should also reflect who you are,” Hafez explains. Khaled Hafez is not an artist in isolation; he has soaked up the force of the local art scene, and inspected the careers of modern artists worldwide. Like his elaborate collages, the artist’s career represents an assortment of artistic influences from across a broad spectrum. Similarly, Hafez’s cultural identity is made up of various layers. Traditional painting characterized the dawn of his career. The artist then explored surrealism and later abstract art. But in 1995, after living in Paris for a couple of years and experiencing an identity crisis, the artist started using figuration to simultaneously explore the layers of his culture while building layers of color and collage that tell the convoluted story of his heritage. Feeling at home in Paris, Hafez returned to Cairo and found that “people had stopped living. They were looking for survival.” Hafez grew up in a modern Egypt, but the he saw its civilization declining in terms of architecture, appearance, and human interaction. Khaled Hafez then spent time in Luxor, where the temple walls introduced the idea of creating visual narrative. The ancient Egyptians (his roots) taught him the most valuable lesson of all -- how to tell a story using figures and colors. Hafez started using his art to make observations and document societal changes. Through dissecting the nation’s cumulative heritage, Hafez endeavors to explore “Egyptianity” -- what it means to be an Egyptian. Khaled Hafez’s formula does not attempt to send literal messages to spectators, but rather inspire thought, deliberation, and appreciation of the artwork as an aesthetic piece. The process for the artist is as important, if not more so, than the final product. He works on several canvases at the same time, painting layers of background with loud music in the background. 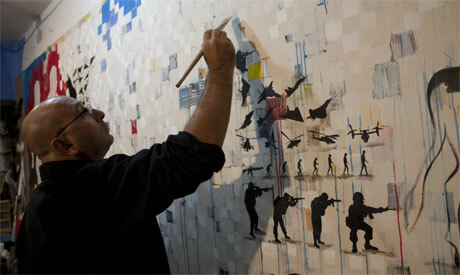 Khaled Hafez demonstrates how art is not simply an act of transferring paint from their tubes onto canvas. For him, art is a way of life; it is his life’s purpose. “Art has been behind every major decision I made in my life,” the artist reveals. Despite the dynamic effect of his color-infused collages, every layer is calculated. “My paintings are both a mathematical and emotional affair,” the artist says. Egyptian symbolism infiltrates Hafez’s art. He cannot escape the heritage that has helped shape the person, and the artist that he has become. “I was baked here,” Hafez says pensively. Khaled Hafez, along with prominent artist Adel El Siwi and their contemporaries, will represent Arab culture at London’s first Arab culture festival, dubbed Shubbak. The citywide festival celebrates Arab art through providing a platform for artists from across the Middle East to present their culture to a European audience. Opening at the MICA (Modern Islamic and Contemporary Art) gallery in London on 6 July is an exhibition showcasing artwork by Arab artists, titled “From Facebook to Nasbook.” Hafez exhibits three pieces painted right before the Egyptian uprising. “This exhibition is a unique approach, mixing the concept of social media with art, and it is very relevant to Egypt as one of the countries of the revolution, as well as contemporary Arab culture,” says Hafez. Paint trickles down his canvases, and paint tubes hang down from the ceiling in his studio. Khaled Hafez’s life is bedecked with art. And he wouldn’t want it any other way.